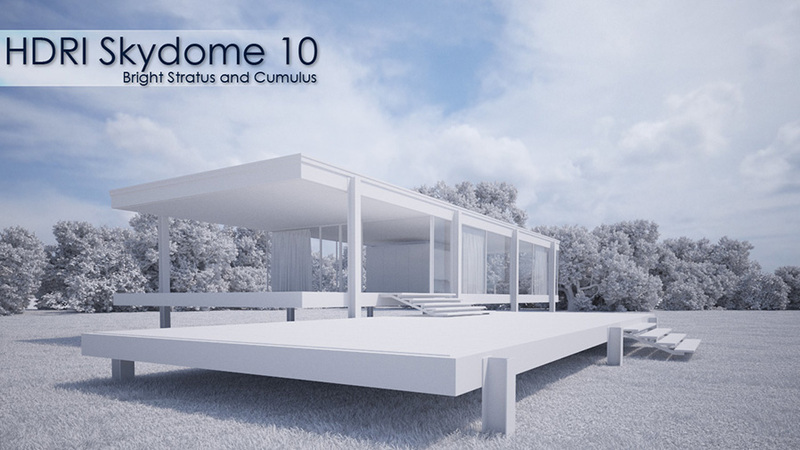 HDRI Skydome 10 is a panoramic 360° image in EXR-format to be used as spherical environment in 3d scenes. The exposure images were taken with a Canon MK5 camera at Berlin-Tempelhof in Germany. All images were manually adjusted and corrected with dust removal, alignment and chromatic abberation correction. HDRI Skydome 10 is a panoramic 360° image in EXR-format with backplates of the sky to be used as spherical environment in 3d scenes. The exposure images were taken with a Canon MK5 camera at Berlin-Tempelhof in Germany. All images were manually adjusted and corrected with dust removal, alignment and chromatic abberation correction. As with other HDRI maps from vizpark I tried so far, not only that it looks good in previews, but it realy works well in actual scenes, both for lighting and reflection. No problems with noise, good balance of intensity, not too strong contrast, not too dark areas in shadows. Thanks to the soft, friendly clouds, works well for the background too, without need to change it in postwork. I expect to use it in many situations where daylight is required. I thing it’s a great feature when trying to take day pictures, really usefull, Thanks VIZPARK! These skydomes are great. they really enhance the backgrounds of your renderings.